ld Tivertonians may remember their town once had its own police force, although it had a troubled beginning. The taxpayers of the borough were extremely unhappy at having to pay the police rate and preferred the services of their indefatigable 'Captain Constable' Mr William Beck who performed his duties for a pittance. It took many years to convince the public and the first Tivertonian Constables stepped out onto East Street on 30 May 1845 – one Superintendent, Edward Harford, and three Constables. For 200 days in 1872, not a single prisoner was committed to the town gaol; a flag flew high above the building until the cycle was broken. 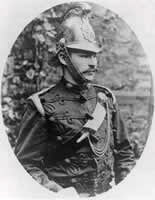 A photograph of Chief Constable Henry Charles Rawle taken in about 1910. At this time Chief Constables in the smaller borough forces also doubled as the fire chief for the area as many of them had become combined police fire services. Inspector Perry with Constable Takle photographed on horseback in the rear yard of Tiverton Police Station in about 1915. The horses which the force normally used were loaned from the Borough Corporation. Their usual daily job was hauling the corporation dustcart, the shafts of which can be seen to the left of the picture. Occasionally another source of horses used by the force, which owned its own tack, was from the stables of the nearby Palmerston Hotel. Sergeant Frederick Williams, seen on horseback at the Devon County Show in 1925, which was held at Tiverton that year. (image © Fred Williams) Sergeant Williams performed almost all of his duties in the Tiverton force after active service in the Great War. He transferred to the Devon Constabulary as a Sergeant following the 1943 amalgamation. On this occasion Sergeant Williams is using a horse on loan from Sir John Amory and it is rather odd to note that he is wearing a peaked cap. 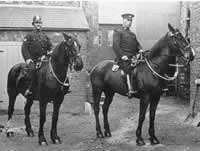 This fact has remained a mystery because at that time Constables and Sergeants usually wore helmets whereas flat caps were invariably reserved for such ranks when engaged on motor patrol duties. In 1929, the existence of the force was threatened when Government commissioners arrived in Tiverton and attempted to convince the borough authorities to merge with the county police. Chief Constable Beynon fiercely defended the eleven-strong force in an extended session at the borough court; the commissioners eventually departed, and the continued service of the Tiverton Borough Police was assured for many years more. It was not until 1942, when the pressures of the Second World War took their toll on Devon, that the force finally amalgamated with the county. Chief Constable Morris of Devon visited the force on 28 November and provided them with new warrant cards, and welcomed them into the county police family. 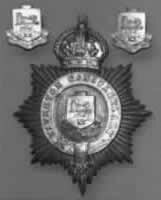 Upon amalgamation, the Chief Constable Mr B. M. Beynon became superintendent of the new C division of the Devon Constabulary which had its headquarters at Tiverton. Like the former Chief Constable of Barnstaple Borough Police in 1921, Mr Beynon didn't have to leave his old force area. 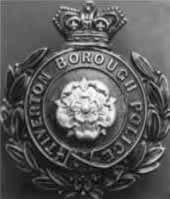 Above: The Tiverton Borough Police prior to its amalgamation in January 1943. It is interesting to note that by the 1940s whistle chains were worn into the left breast pocket. The first helmet plate badge of the Tiverton force. 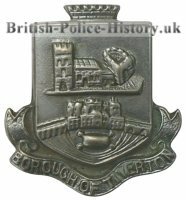 In common with many other constabularies at the time, early badges bore the Victorian crown and name of the force but had a plain centre. (image © Metropolitan Police Museum). 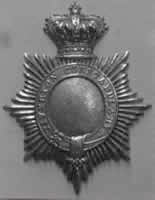 The force helmet plate badge of about 1890, which had a Victorian crown and a more ornate design than the previous badge. This design did not last many years as it was changed to reflect a more appropriate image of the borough of Tiverton. A king's crown helmet plate badge and collar dogs (image © Dave Wilkinson), bearing the borough crest. A closer view of the collar dog at left, bearing the borough crest.